Russian rabbi and author; born in Turetz, government of Minsk; died at Minsk in 1889. He was a son-in-law of Rabbi David Tebele of Minsk, whom he succeeded in the rabbinate of that city, holding the position for thirty years. 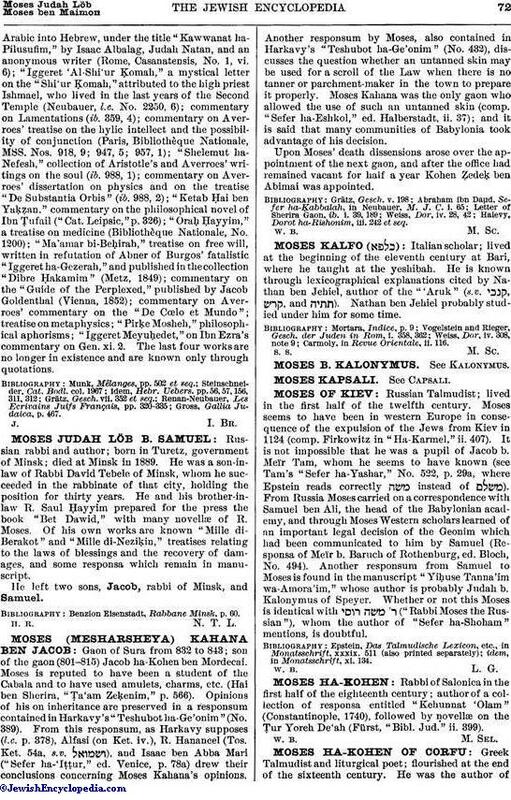 He and his brother-in-law R. Saul Ḥayyim prepared for the press the book "Bet Dawid," with many novellæ of R. Moses. Of his own works are known "Mille di-Berakot" and "Mille di-Neziḳin," treatises relating to the laws of blessings and the recovery of damages, and some responsa which remain in manuscript. He left two sons, Jacob, rabbi of Minsk, and Samuel. Benzion Eisenstadt, Rabbane Minsk, p. 60.